Part homage, part artistic and sociological journey, The Wall of Birds tells the story of birds' remarkable 375-million-year evolution. 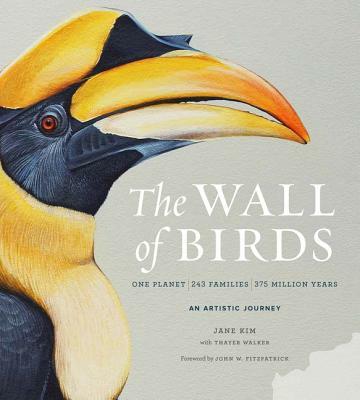 With a foreword by John W. Fitzpatrick, director of the Cornell Lab of Ornithology, and full of lush photographs of gorgeous life-size birds painted in exacting detail, The Wall of Birds lets readers explore these amazing creatures family by family and continent by continent. Throughout, beautifully crafted narratives and intimate artistic reflections tell of the evolutionary forces that created birds' dazzling variety of forms and colors, and reveal powerful lessons about birds that are surprisingly relevant to contemporary human challenges. From the tiny five-inch Marvelous Spatuletail hummingbird to the monstrous thirty-foot Yutyrannus, The Wall of Birds is a visual feast, essential for bird enthusiasts, naturalists, and art lovers alike. Jane Kim is a visual artist, science illustrator, and the founder of Ink Dwell, a studio that creates art that explores the wonders of the natural world. Her art career started when she was a little girl obsessively painting flowers and bears on the walls of her bedroom. She received more formal training at Rhode Island School of Design and then Cal State Monterey Bay, where she received a master's certificate in science illustration. She has created numerous large-scale public works, and in addition to the Cornell Lab of Ornithology, she has produced works for the National Aquarium, the de Young Museum, the Nature Conservancy, the Smithsonian Tropical Research Institute, Facebook, Recology, and Yosemite National Park. She is the creator of the Migrating Mural campaign, a series of public installations that highlight wildlife along migration corridors they share with people. She still enjoys painting flowers and bears, though nowadays she doesn inkdwell.com. Thayer Walker is an author, journalist, and cofounder of Ink Dwell studio. He has served as a correspondent for Outside magazine for more than a decade and has covered topics ranging from civil war to submarine exploration of the deep sea. He once survived twenty days stranded on a desert island for a story and discovered the 6.67 carat Teamwork Diamond, the tenth-largest diamond ever found at Arkansas Diamonds State Park. His work has been published by dozens of media outlets including the New York Times, NPR, Men, The Atlantic, and Scientific American. For more of his writing, please visit thayerwalker.com.